One: This morning, two days before Christmas, we light the four candles of Advent: the candles of hope, peace, joy, and love. All: We gather to worship our God, whose love reaches to the heavens. One: We gather to be with people we love, people who love us. All: We rest in God’s unfailing love. One: Let us light the candle of love. One: Let us pray. Holy One, may your love for us warm our hearts and light our way, that we may share your healing love with a broken world. All: May this time of worship allow us to bask in your love for us; and may our worship empower us to love all. Amen. Go forth to live within God’s deep and abiding love. Go forth to live out God’s deep and abiding love–in the power of our one God: Creator, Redeemer, Sustainer. 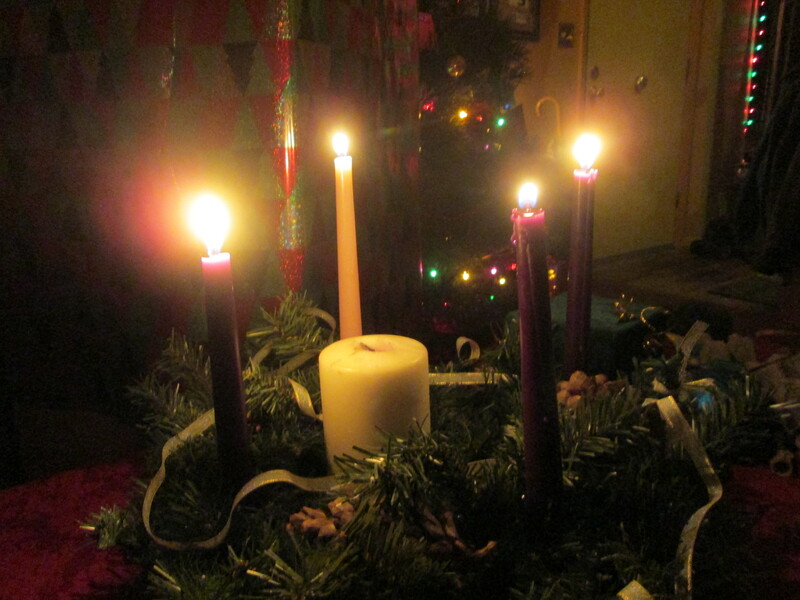 Liturgies for the first, second, and third Sundays of Advent can be found in previous posts. I have also posted the text of this year’s Christmas Eve service.